Conditions for travel have changed and are still changing the world - a world experiencing what John Urry calls the `mobility turn'. Since World War Two we have been moving faster and going further - a fact that has profoundly changed our way of experiencing both the world and ourselves. The explosion of low-cost travel options has similarly had an important impact on the economy, adding to the globalization of markets and transformations in modes of production. It is no longer possible to think of nation-states as autonomous vis-a-vis one another, nor of cities or regions as homogenous spaces delimited by clear-cut borders. Societies, like Western cities, are redefining themselves through mobility. What does this mean for the city - for its governability and governance? 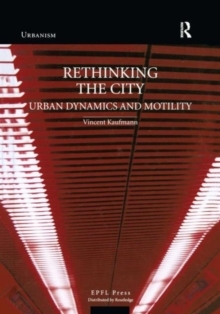 In this book Vincent Kaufmann assesses the urban implications of the mobility turn. He explores the modern urban phenomenon from the point of view of the mobility capacities of its players - their motility. He asks that the reader consider the idea of a city or region as the product or an arrangement of a specific set of motilities. Re-Thinking the City seeks to identify how the motility of individuals, goods, and information acts as an organizing principle - or rather, the organizing principle - of contemporary urban change, and then aims to examine the consequences for urban governance by exploring the channels through which individual and collective motility can be regulated.